OMAHA, Neb. (KMTV) — Former Nebraska Governor and U.S. 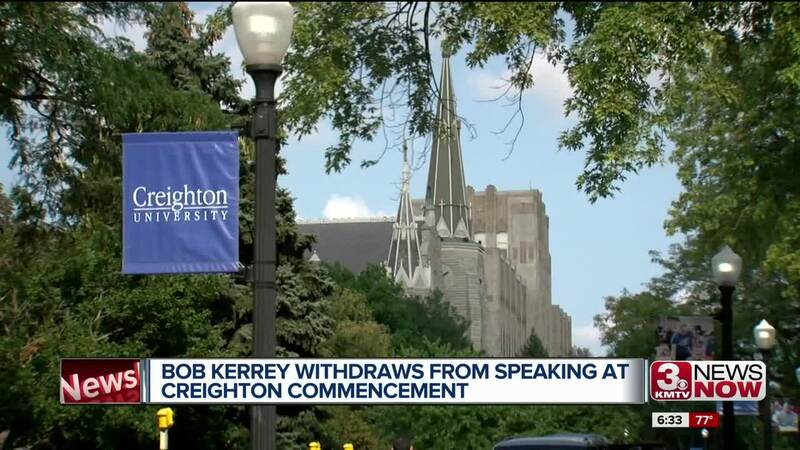 Senator Bob Kerrey will no longer speak at Creighton's commencement ceremonies. Kerrey initially accepted the request by Creighton, but rescinded earlier this morning. The controversy started when the Nebraska GOP released a statement about Kerrey's past votes on pro-abortion rights. "Bob Kerrey voted five separate times against banning the grisly and inhumane practice of partial birth abortion while in the United States Senate," said Ryan Hamilton, the Executive Director of the Nebraska GOP. "He has a lifetime score with the National Right to Life of just four percent, putting him in the company of some of the country's most extreme abortion advocates." "Nebraska is a pro-life state and Republicans are a pro-life party. We strongly urge Creighton to take a stand for their pro-life values and find a more appropriate figure to honor at their upcoming commencement," Hamilton said. Kerrey released a statement, saying: "Commencement should be a moment of celebration and not disrupted by politics. My son is one of your graduates, and I feel a deep indebtedness to Creighton for the good you have done my family." Creighton President Rev. Daniel S. Hendrickson also released a statement saying: "I am grateful for Senator Kerrey's discernment regarding this important matter, and I appreciate his desire not to have the focus of the day shifted away from our students. I am working with members of my leadership team regarding our Commencement speaker and hope to be able to share the good news very soon." Hendrickson adds that Kerrey will be on campus next fall for a lecture as part of the Presidential Lecture Series. Those dates have not been released yet. Jane Kleeb and Executive Director Jim Rogers issued the following comments Monday after former Gov. and U.S. Senator Bob Kerrey withdrew [omaha.com] from giving a commencement address at Creighton University on May 18 following pressure from the NGOP [omaha.com] because he is pro-choice. “Sen. Kerrey lives his life defending our country and freedom of speech. The Nebraska GOP is taking a page out of President Trump’s playbook,” Kleeb said. “They are applauding Trump’s Executive Order on freedom of speech on college campuses, while at the same time bullying a private university to cancel a speech because they do not agree with Sen. Kerrey’s words. Said Rogers: "The Republican Party put their own political battles in front of young people graduating from Creighton University. It is truly unsettling that Republican leadership is interfering with a day that should be celebrated by families and students,. “If the goal of the Nebraska Republican party leadership was to copy the daily chaos emanating from the White House, I award them an A+ for success,” Rogers said. “They truly owe the students, their families, and the University a sincere apology for wrecking a monumental day. They also owe Sen. Kerrey responses to the questions he posed to them."